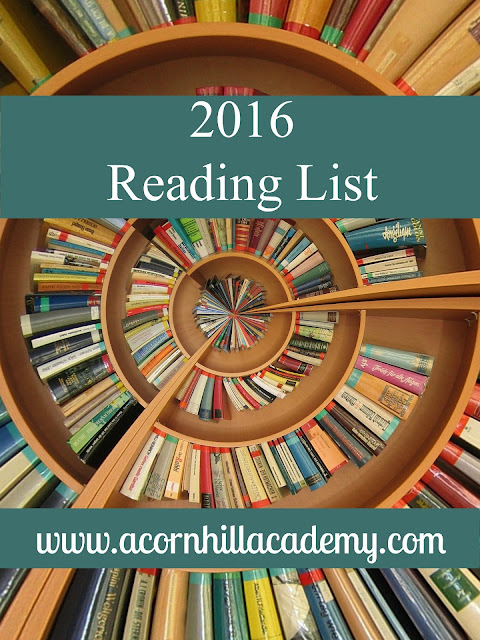 Do you make a reading list for yourself at the beginning of the new year? I have seen several people do this, and there are always reading challenges floating around in the blogosphere. Anne over at Modern Mrs. Darcy put up her 2016 Reading Challenge, which involves reading twelve different books in twelve different categories over twelve months. That sounds reasonable, doesn't it? My issue is this: I have a reading list aversion. If I make a reading list, I no longer want to read the books on it. It's fairly ridiculous, actually. I have no idea why this is. This year, though. I've done it. I've made a list, and have hopefully left some room on it for books I haven't met yet. In fact, I've already gone on a rabbit trail and checked out five books from the library. I was having a hard time deciding if I wanted to focus on C.S. Lewis or Shakespeare. Someone shared a challenge on Facebook to read all of Shakespeare's works in a year. I was tempted; I've been enjoying Shakespeare with my girls, but I haven't read lots of what he wrote. However - that's a LOT of Shakespeare. I'm not sure I'd have time to read much else. Honestly, I know myself. There is no way I would read only Shakespeare for an entire year. I'm part of a Facebook group of passionate book people, and they have reading events all the time. This year, I signed up for four year-long events in which we will explore different authors, genres, or concepts. I'm also planning to re-read the Chronicles of Narnia, because it's been a while, and I love them. As it turns out, I haven't read any of those yet. I'm excited to explore some new-to-me Shakespeare and not feel overwhelmed by the selections. The third group is a survey of American Character. We were originally going to start with a biography of Abigail Adams (wife of John Adams, 2nd U.S. President), but it seems the group didn't like some of the assumptions made by the author. Instead, they decided to read John Adams by David McCullough. Have you seen that book? It is 752 pages long. SEVEN HUNDRED FIFTY TWO PAGES. Do you know what my response has been to this book, every single time I've considered reading it? "Why? Why would someone write a book that long? And why would anyone want to read it?" Don't I sound scholarly and well-read? Ha. It's actually on the Ambleside Online list for the year my girls are in, but I didn't assign it. They wouldn't have had time for much else, even had I broken it out over the whole year. It's supposed to be an excellent book. Here's hoping it is, because I will never finish it if it isn't a rip-roaring good read. I'm hoping to read both selections each time, since I haven't read any of them before (except A Wrinkle in Time). Although I've read it more than once, it feels like a new experience in many ways, even as it feels like returning to an old friend. I confess, I'm feeling a bit trepidatious about this reading list thing. I'm excited, though, because I'm reading most of the books on my list with other people. I love to talk to other people who love books like I do! In addition to the books for the events in my Facebook group, I have been eyeballing books on the lists of last year's reading from a couple of my favorite people: Liz Cottrill at Living Books Library, and Nancy Kelly at Sage Parnassus. If you're looking for possible reading selections, check out their lists. I do the exact same thing with reading lists. Why?? This year, I thought I'd try a different tactic and make a pile of books rather than a list of books. The pile sits beside my most comfortable chair and is supposed to remind me to tackle it. I've read several books this year, but still not any from that stack. Ha! And I agree - skip the word OR in that last list. The final four books you listed are MUST READS!! I have tried piles, and they get so big they topple over. Have you seen those reader's side tables? They're mini-bookshelves that can sit by your reading spot. They are so pretty. I'm not sure they'd help me be better about reading from my list, but pretty is good, right? My daughter reads David McCullough's books for pleasure, lol. I am jealous of your Facebook book groups! Looks like you have much fun reading in the year ahead. I opted to create my own unofficial book challenge because I didn't want to follow a list for the year. Thanks for sharing you list! Sharon, I would love to hear about your unofficial challenge! My dad likes McCullough's books, and everyone who reads biographies seems to like his. It's really not my genre, but I'm trying to be more well-rounded in my reading. I did a blog post about my "unofficial challenge". It is solely a result of me having no self control over bringing books home from the library. And I have a small rebel streak that just refused to conform to predetermined lists.